The Manhole is a children's adventure game by Cyan (now Cyan Worlds). In this game, you open a manhole cover and find a beanstalk that you can either climb up or down, leading to fantastic new worlds in either direction. There is no beginning or ending to the game. The goal is just to explore and have fun. The game was first developed as a floppy disc game for Macintosh using the HyperTalk programming language by Cyan in 1988. In 1989, Activision produced a DOS version of the game with their MADE, then in 1992 they used a later version of the MADE engine to produce a CD-ROM version of the game called The Manhole: New and Enhanced. 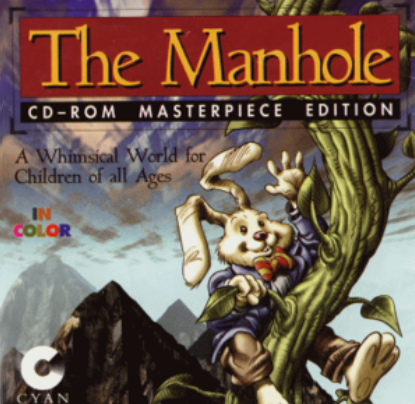 In 1995, Broderbund produced another CD-ROM enhanced version of the game called The Manhole: Masterpiece Edition, which had improved graphics, and had music, voices, sound effects, and some new characters. The versions of Manhole that were produced by Activision with the MADE engine are now supported by ScummVM, a program designed to let 2D adventure games run on multiple platforms. With ScummVM, The Manhole now runs on modern versions of windows, as well as Linux, Mac OS X, and many consoles such as Dreamcast, Wii, PlayStation 2, and PlayStation Portable. For a complete list of platforms supported by ScummVM, see here.